An artist who helped define a period in popular culture, Johnny Marr tells his story in a memoir as vivid and arresting as his music. The Smiths, the band with the signature sound he cofounded, remains one of the most beloved bands ever, and have a profound influence on a number of acts that followed—from the Stone Roses, Suede, Blur, and Radiohead to Oasis, The Libertines, and Arctic Monkeys. 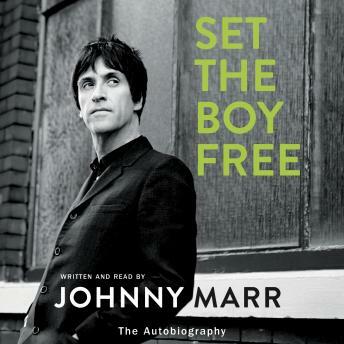 Marr recalls his childhood growing up in the northern working-class city of Manchester, in a house filled with music. He takes us back to the summer of 1982 when, at eighteen, he sought out one Stephen Morrissey to form a new band they called The Smiths. Marr invites fans on stage, on the road, and in the studio for the five years The Smiths were together and how after a rapid ascent, the working-class teenage rock star enjoyed and battled with the perks of success until ideological differences, combined with his much publicized strained relationships with fellow band mates, caused him to leave in 1987. Marr’s “escape” as he calls it, ensured the beginning of the end for one of the most influential groups of a generation. But The Smiths’ end was only the beginning for Marr. The bona-fide guitar hero continues to experiment and evolve in his solo career to this day, playing with Paul McCartney, Pretenders, Modest Mouse, Oasis and collaborating today’s most creative and renowned artists. Rising above and beyond the personal struggles and bitter feuds, Marr delivers the story of his music and his band, sharing the real insights of a man who has made music his life, and finally giving fans what they’ve truly been waiting for. Absolutely brilliant. To hear the story of one of the greater guitar players of our time told by the man himself was perfect. Digging deep to tell of his inspirations and reasoning behind writing such brilliant songs. The mans a legend. Inspiring to say the least haven't out my guitar down since. My first exposure to an audiobook with narration from the autobiographer himself! Absolutely great! A vivid glimpse of the life of Marr most known for his work with Morrissey, then later "The Smiths" and everything before and after. A must for fans of music lovers.